It looks as if writer/directors Jon Lucas and Scott Moore have a very limited range of topics they're interested in tackling as they've now made the change from three men behaving badly to three women more or less doing the same thing. Lucas and Moore wrote the original Hangover screenplay which bodes well for them in my book and with that clout the duo went on to pen and direct 2013's 21 & Over which was fine, but forgettable and unfortunately underutilized the talent of Miles Teller while attempting to capitalize on the success of Pitch Perfect by placing Skylar Astin front and center. And so, with their latest Lucas and Moore have re-directed their focus towards the females as they were fortunate enough to cast Mila Kunis, Kristen Bell, and (most importantly) Kathryn Hahn in their film that looks unsurprisingly similar to their previous efforts. Granted, enough charm could certainly come from the perspective change that Bad Moms will be worth checking out. In the film, three overworked and under-appreciated moms are pushed beyond their limits finally deciding to ditch their conventional responsibilities for a jolt of long overdue freedom, fun, and self-indulgence. The trailer hints at as much being accomplished as Kunis' character defies the strict and uptight PTA President (Christina Applegate) that, if nothing, else should provide a solid amount of laughs. The rest of the trailer has something of a forced tone to it, but I enjoyed Bell in The Boss this year, have always admired Kunis' comedic abilities, and am just happy to see Hahn in such a prominent role in a comedy led by and about women. Though the film is about breaking conventions these trailers certainly hint at a movie that falls into some pretty standard ones. I'm hopeful, but only time will tell. 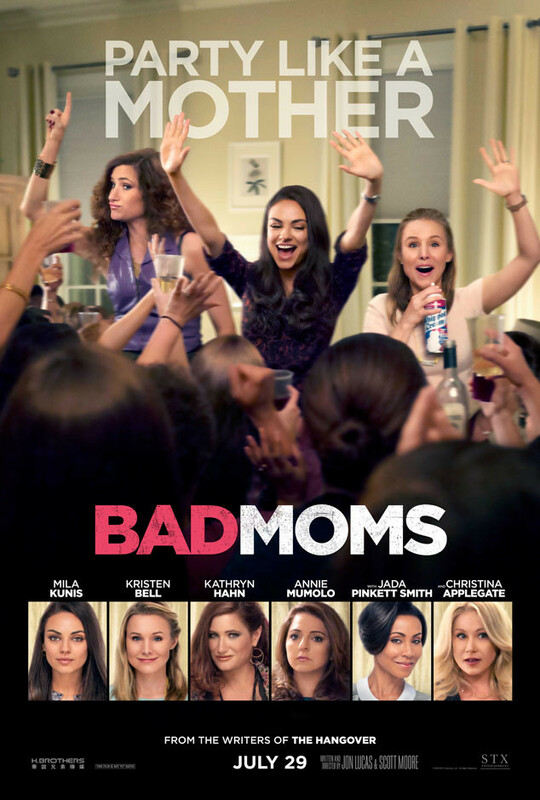 Bad Moms also stars Jada Pinkett Smith, Annie Mumolo, Emjay Anthony, Oona Laurence, and opens on July 29th, 2016. Synopsis: In this new comedy from the writers of THE HANGOVER, Amy has a seemingly perfect life – a great marriage, over-achieving kids, beautiful home and a career. However she’s over-worked, over-committed and exhausted to the point that she’s about to snap. Fed up, she joins forces with two other over-stressed moms on a quest to liberate themselves from conventional responsibilities – going on a wild, un-mom-like binge of long overdue freedom, fun and self-indulgence – putting them on a collision course with PTA Queen Bee Gwendolyn and her clique of devoted perfect moms.